If all the ingredients are added it comes to 7 Cups - hence the name is 7 (Seven)Cups Burfi. As 7 Cups would be give me too much of the finished product, I prepared half the quantity in the original recipe - Thus if you like you may call it Three and half cups Burfi also !!! LOL:):):)﻿. Make fine powder of sugar in a mixer grinder. Make powder of cardamom seeds and keep it covered till use to retain aroma. Chop all the nuts into small pieces. Grease a tray and spread a parchment paper in it and grease the paper with ghee. Heat a heavy bottomed pan and add gram flour into it. 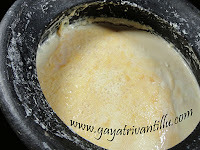 Fry the gram flour on low flame stirring continuously for ten minutes or till we get nice aroma of roasted gram flour. Take the roasted flour into a bowl. Heat and melt ghee. Add chopped nuts and grated coconut to melted ghee and fry for a minute. Then add gram flour, sugar and cream and mix well and cook stirring. When the mixture thickens and starts leaving the sides of the pan add cardamom powder and mix. Transfer the burfi to the greased and lined tray and spread evenly. Cool till half set at room temperature. Mark the burfi using a greased knife and cool in refrigerator till fully set. Remove the burfi from the tray by lifting the parchment paper. 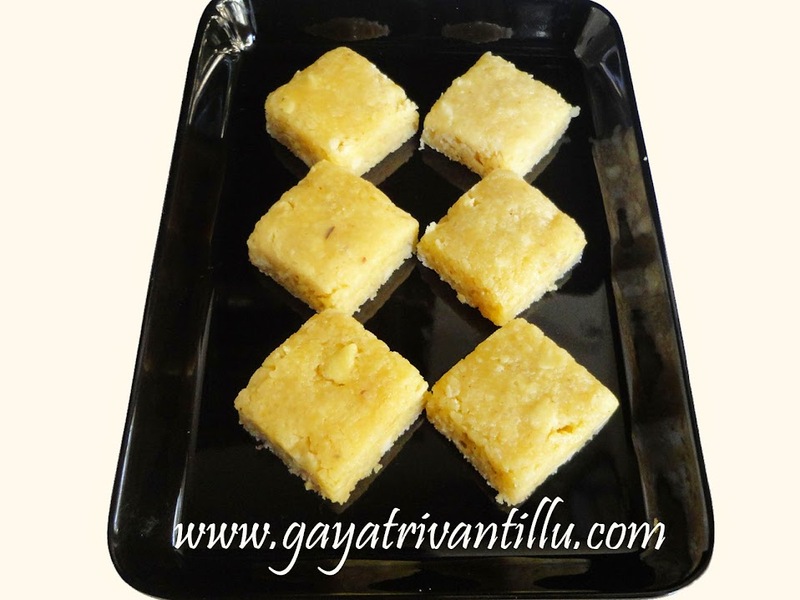 Cut the burfi along the marked lines and place in a tray. Store the burfi in refrigerator and serve at room temperature. Fry gram flour on low flame only stirring continuously or else it would burn. Use sugar powder for easy mixing than granulated sugar. Granulated sugar takes time to melt—meanwhile the other ingredients get cooked fast and we end up in getting sugar crystals while eating burfi. Use fresh coconut to get good taste. Take parchment paper slightly bigger than the tray in which burfi is to be set as it would be easy to lift the burfi from tray by holding the parchment paper. Depending upon the water content in the mixture decide the flame on which the burfi is to be cooked. 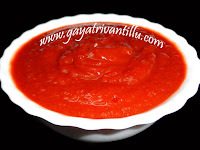 If the water content is more, then cook on high flame till it starts thickening and then cook on medium flame to low flame to have control on the situation. If the mixture is slightly thick, then it is advisable to cook burfi on medium flame to low flame. In any case cook the burfi till thick but not till hard---remember one should be able to spread burfi in the tray---on cooling it thickens further. Use any nuts like almond, cashew nuts, pistachios or walnuts. Chop the nuts to small pieces to get mixed easily in the burfi and give nice crunch while eating. But remember not to chop using an electric chopper as half the nuts gets crushed to powder in the machine. Mark the burfi while it is still warm as it would be easy to cut when it cools down. Store the burfi in refrigerator and serve at room temperature.